Sheaths for your favorite hand forged axes and tomahawks. Our sheaths come in leather, nylon and come in a variety of sizes & lengths. 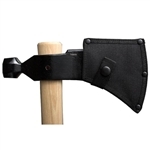 Keep your tomahawk safe and secure when not in use with this durable Nylon throwing tomahawk sheath. It comes with a belt loop and protective inner lining for the blade. Will fit thrower supply hawks SKU's: TM101, TM102, TM105, TM111, TM112, TM113, TM114, TM117. Keep your tomahawk safe and secure when not in use with this durable Nylon throwing tomahawk sheath. It comes with a belt loop and protective inner lining for the blade. Will fit throwing tomahawk with a 4" blade or less and an overall head length (front to back) of 6.4 inches or less. Keep your tomahawk safe and secure when not in use with this durable Leather Throwing Tomahawk Sheath. It comes with a belt loop and protective inner lining for the blade. Will fit throwing tomahawk with a 4" blade or less and an overall head length (front to back) of 6.4 inches or less.